Psychic Light has been involved with Charity work from the start. Psychic Light’s founders and directors Laurence and John have always had a genuine care for the poor of the world. Laurence spent some time in the mission field in Sierra Leone in the 90’s and became very aware of the poverty of that nation and Africa generally. He also visited India, China and Central America and spent some time teaching children from age 9 to adult over a 12 year period. Having 3 children of his own he is incredibly aware of the need for health support and good education. When the vision came to start Psychic Light in the year 2000, Laurence had been working as a Psychic Medium doing face-to-face and telephone readings for about 5 years. His greatest desire was to start a company that could help support his main charity Plan International. 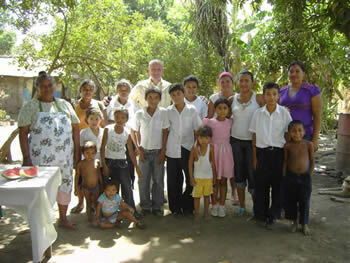 He had already sponsored his own child, Jose, from Nicaragua and then the company took on 4 other children to sponsor, one from each continent. John had a great interest in the problems folk faced after world disasters. So the company has supported many victims of natural disasters such as earthquakes, Tsunamis, drought and crop failure through charities such as Unicef, Action Aid and Water-Aid. We have had the pleasure of seeing many children benefit from our work and donations to these causes and we feel it has brought the company great karma. The continued success of Psychic Light is we believe, due to having excellent spiritual workers and a good track record of giving back to worthy causes. Please be aware your support is greatly welcomed and hopefully to know some of your expenditure goes on these good causes. We are not some big indifferent corporate company, we are a team of caring psychics and workers, which has led to us being one of the foremost psychic companies folk use. So please continue to support us and in turn we will support others.